Four or five years ago I was approached by a publisher who wanted to make a book out of my chapter-a-day posts. I won’t lie to you. I was thrilled and flattered. Being an author has always been a bit of a dream. At that point in this blogging journey I’d just about blogged on every chapter of the New Testament, so I quickly made plans to package that for publication as a book of devotional thoughts. I made preliminary arrangements with the publisher, hired an editor and began the task of compiling and cleaning up the material. When the contract came from the publisher and I began to read it through, I suddenly woke up to the hard reality of the situation. I would be signing over the rights to the material in all of those posts to the publisher. I would have to delete each one from my blog and take them off-line. I would no longer have any control of the content. It would be the publishers material to package and sell as they wished, and it would no longer be in my hands. I will never forget the conversation Wendy and I had that day. It was Wendy who saw the obvious and did not hesitate to answer. “I think your posts reach far more people than you realize,” she said to me. She then told me directly that she felt that it was the wrong decision to package and sell what has been, and should be, freely given. She was right and I knew it as soon as the words left her lips. Just like Paul relates in today’s chapter, I was called to proclaim God’s Message [which is another story I’ve been reminded that I need to share in a post someday – thank you, Kevin]. I am compelled. Perhaps I will still realize my dream of being an author someday. It will not, however, be my chapter-a-day posts. 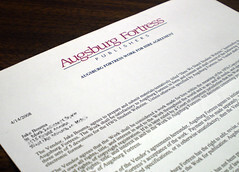 I threw away the publisher’s contract that day and told them I was respectfully declining their offer. The posts would remain on-line and freely available to anyone who cares to read them. My payment is the simple knowledge that you’re reading these words. Tom, I remember talking about this. I appreciate your integrity with this decision. Thanks for your witness. I hope it is contagious in the midst of greed and self-preservation. Tom, please check your computer. You should have received a notification. Oh Tom. I know it has been a while. The process has begun and will continue. Check your email notification. I have a gift for you that I want you to open. Can I swing by after lunch?